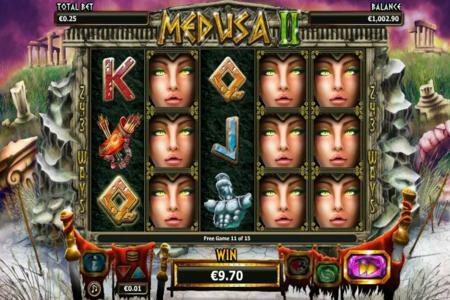 A Medusa II slot is the second in the series of Medusa free best slots games. It is based on Greek mythology of a Gorgon named Medusa who had live snakes for hair and could turn you to stone with a single gaze! The Characters Of Medusa II Slots, One of The Best Slots – Register Now! This best slots game was developed by NexGen as an improvement on its already existing Medusa slot. The lower value symbols are 10, J, Q, K and A. While other symbols include -a quiver of arrows, a stone turned victim, a bronze helmet, a golden snakes objet d’art, and not in the least a stunning green-eyed Medusa. Big rewards await you at Medusa II slots as you trigger the Bonus features like free spins, Medusa’s Locked reels, Turned to Stone Stacked wilds and Gamble feature while playing the Best slots game. This bonus feature is triggered when 2nd, 3rd and 5th reels stop and lock together displaying same symbols. This can land you big wins. Free spins are obtained when 3 or more scatter symbols appear on your reels. Reels get locked and you can earn about 5 free spins to one round. There is a guarantee of a 2 locked reels for every spin. A soldier may sometimes appear on your reel and attack Medusa. Her stare makes him stone-stiff and you earn a stack of wilds. You can trigger the gamble bonus after every win by clicking the hearts/club button under reels. If you are able to correctly predict the next card’s colour or suit, your earnings may double or improve four times. This feature can be used 5 times continuously. Beware! This feature should be used cautiously. 5 matching symbols including Stone soldiers +quiver of arrows will improve your bet 200x. 5 gold serpents will improve your stake 300x. 5 serpent holding helmets improve your stake by 400x. Medusa triggers wild Bonuses on all reels and plays the substitute for all symbols except the scatter symbol. Earn 20x your bet on 3 wilds,50x for 4 wilds and 500x for 5 wilds. Scatter symbols 3 scatter symbols pay out 50x, 4 scatter symbols pay and 5 scatter symbols pay 350x of your bet. The Medusa locked reel bonus locks and unearths new prizes as it respins. Firstly, you can play this game online or use your mobile. Secondly, this game is Medusa slot machine free as it is not an Android slot game. It means you can play the flash version with downloading any files. Third, big payoffs are one of the characteristics of this slot game. Aesthetic animation interesting storyline and end-to-end functionality leave a lasting impression on your mind. You can easily make your deposits using Boku at Casino UK. Real money slots pay by phone charges your deposit on your phone credit bill. Casino UK offers the best slots in business. You can register for free at Casino.uk.com. Some online offers and promotions are mentioned below. The minimum deposit is £10 with a maximum £100 bonus feature for all the games 19th to 25 January 2017. On all Mondays this January, avail 50% match up to £100. Casino UK’s best slots welcome new members, aged above 18 years, with 100% Bonus match up to £200. Play up to £5 free with any deposit. Make three deposits with the following features. Fairness and Responsible gaming is a very important aspect of at Casino UK’s operations. It is a Medusa Party game all the way. Avoid Medusa 2 super girl’s stare; earn all the bonuses whilst averaging 10 – 20x on your bets with Medusa II slots at Casino UK.